The Mileaukee Bucks will host the Sacramento Kings on Sunday night in the NBA. The Bucks (7-1, 5-0 home) were expected to be a 4th or a 5th seed in the East this season, but they have played even better than that so far. 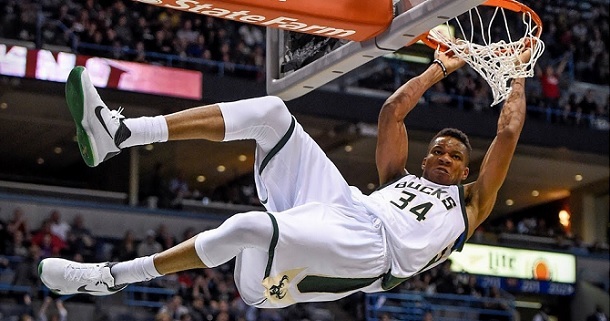 Giannis Antetokounmpo is playing out of his mind and might be an early frontrunner for MVP, and the Bucks did a good job to surround him with superior talent this year (Lopez, DeVicenzo, Ilyasova and a better coach in the form of Mike Budenholzer). It`s fair to say that Milwaukee is playing some of the basketball in the NBA right now, having won 7 straight before finally losing their first match a couple of nights ago – a narrow 4 point defeat in Boston against arguably the second best team in the league. The Kings (6-3, 4-2 away) have shocked everybody so far this season. Considered to be one of the 2-3 worst teams in the league, Sacramento has amassed a very surprising 6-3 record on the back of some great offensive play – only 3 teams in the NBA are scoring more PPG than them. The Kings are coming after a spectacular 146-115 victory in Atlanta two nights ago. Bet on Bucks v Kings and claim your 100% (120 Eur) welcome bonus at LSbet now! Team news: The Bucks only miss fringe players Jodie Meeks and DJ Wilson, both out long term. The Kings will still be without Bogdan Bogdanovic and might miss Troy Williams as well, although the last one is not an important piece. The Kings are definitely the feel good story of the NBA right now, and they are playing with great intensity and pace, making use of their athleticism. But all in all it`s unreasonable to expect the same success from them long term this season. A fair case can be made that the Kings had an easy schedule, although they played most of their games on the road. Most of their wins came either against very bad teams, or against teams which were in crisis and / or missing players. There`s also the fact that they simply have been making shots at a higher rate than normally. A very interesting statistic has been brought up by Amin Elhasan, former Suns assistant GM and one of the best NBA analysts on TV. The stat is based on a “quality of shot” analysis by secondspectrum.com and suggests that based on the shots the Kings are taking, and the players taking them, their percentage is actually 5% higher than it should be – and that`s a lot. Basically they are making tough shots (which the eye test supports), and that will not last forever. Considering the above and the fact that the Kings shot lights out in the last game against Atlanta, scoring 146 shots, you would definitely expect them to have less success shooting the ball against the Bucks. A young team like the Kings should struggle shooting lights out for two games in a row, especially as they will now face one of the premier teams in the league. As for the Bucks, they have been great all season, and they should match up well against the run & gun style of the Kings, considering that Giannis is a serial killer in the open court and in transition, and he will get these kind of opportunities on a consistent basis in this match. Look for the Bucks to bounce back after suffering their first loss of the season. Their last 5 wins all came by 11 or more points, a margin which would be enough to cover the line here against a Kings side which is not quite as good as their record suggests. My tip will be the Bucks to cover the 10 point spread. Prediction: Milwaukee Bucks – Sacramento Kings 128 – 110. I heard about them being sister site of 1xBet but I didn`t find anything official, so I didn`t mention it. It`s almost surely true, as they are both registered in Limassol. It`s not a “copy”. Website is different, odds are different, betting coverage is different, etc. I am sorry about your experience with 1xBet, at least I`m glad that you did get paid one way or the other, despite the issues with Paypal. I have to admit I did have another user complaining about them via e-mail. Regarding complaints, I read them. The thing is that the Internet is full of complaints about every bookie. Even Pinnacle or Betfair. Some people will always have bad experiences and they will write about it (nobody will write about the good things). Plus, many people are actually at fault for their problems. I say this from years of experience. So while complaints do raise a red flag, you can never take them at face value when reviewing a bookmaker. Don`t get me the wrong way. I am not trying to defend any bookmaker and I`m not saying you are wrong, I am just bringing some counter-arguments. I am always trying to write honest reviews, and regarding 22Bet (I don`t think anything written in their review is false or misleading), you can see that I mentioned that the betting limits are dodgy, and in my conclusion I recommended users to start with smaller stakes to make sure they don`t have problems with payments.